This year as well as the usual home-grown preserves and baked shortbread, I've been creating a few special things with fabric, fibre, and thread to gift to those that are nearest and dearest to my family and I.
I followed this great pattern by the fabulous crochet designer Sonea Delvon - only difference being that I used 8ply yarn and a 3.5mm hook instead of the 5ply and 2.5mm hook that Sonea suggested. For the yarn, I used my all time favourite 8ply cotton blend (the same yarn that I used for my rainbow granny blanket back here). This yarn is AMAZING!! It washes so well and wears even better. I love that the more it ages and is washed the softer it gets. 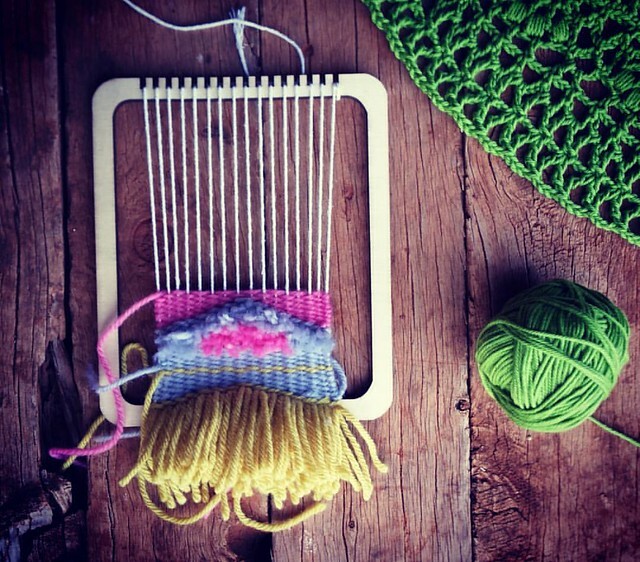 I'm also weaving a special little something for an equally special person. This is my very first weaving project and I must admit, I'm absolutely hooked!!! The pattern I'm following was part of a kit made by the very clever team at Mollie Makes and I simply love it. If you've never heard of Millie Makes before then please go check them out, they seriously are amazing and a huge source of inspiration for me and my crafting. 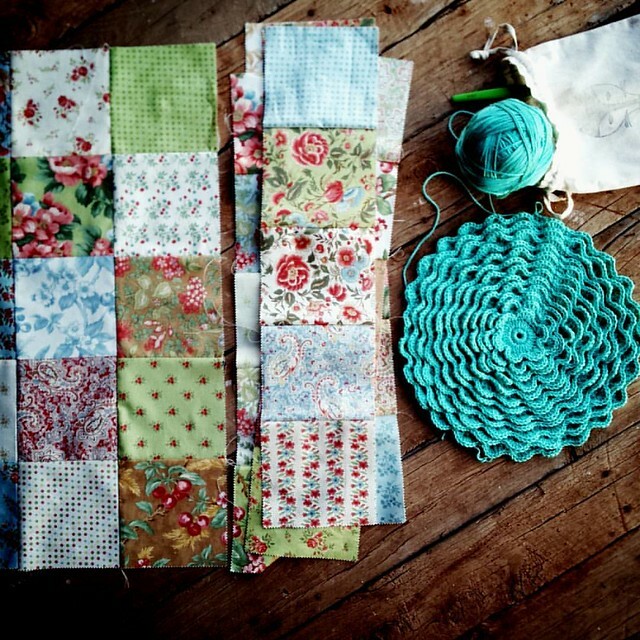 I'm also working on a wee little quilt which I'm backing with old fabric bread flour bags. This quilt is to be used as a tablecloth also. The fabrics are from my stash and there's not really a pattern, I'm just sewing 5' squares together in strips in a colour combo that I like. I'm making this quilt light weight and durable - hence the muslin/calico bread bags that I'll be using for the backing fabric. And on the right of the quilt is the makings a flower pillow. I'm only half way through this pillow but am hoping that over the next week it will double in size and be well on its way to being finished in time for Xmas gifting. 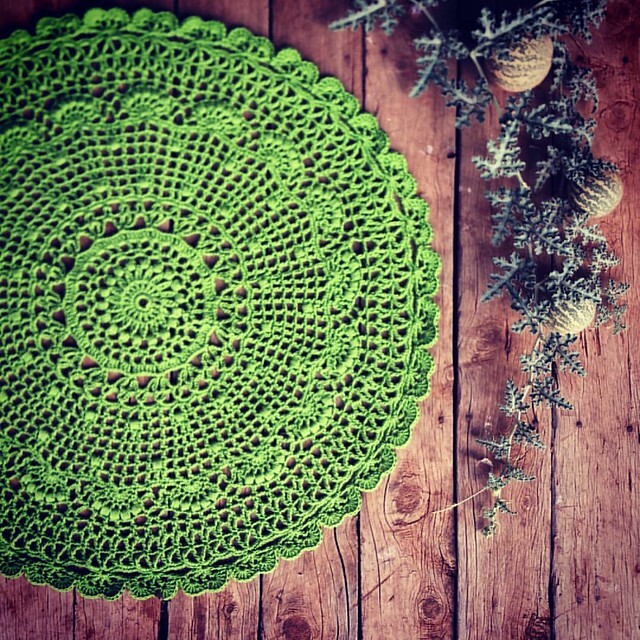 I'm using the Blooming Flower Cushion pattern by Lucy of Attic 24, a 3.5mm hook and that same gorgeous cotton that I used for the green tablecloth above (just in a different shade, of coarse). So, how about you, do you love a 'handmade' Xmas? Are you crafting up a storm, so to speak... Creating lots of lovely things for your loved ones this year too? Do you have a 'back-up' plan if you run out of time and don't quite get that special something finished? Or maybe you're taking it easy, not worrying about the material objects this year, focussing on spending 'quality time' with loved ones instead? Love Love Love the patchwork! I'd love to see that when it is finished. I'm sadly not having a handmade Christmas...BUT...I am easing up my work load this year for the first time ever. I usually host Christmas, prepare and do everything for it, I'm the type who says "No don't bring anything, I've got it all under control" But this year when the people coming offered I SAID YES! Which sees me only having to make only one salad and a trifle, which can all be done the day before. I'm really looking forward to making MY family a nice breakfast, then sitting down with the kids and playing with them on Christmas morning, instead of rushing to get lunch ready...Who would have thought hey! Your Xmas sounds simply perfect, and good on you for having the courage to allow others to help you prepare for the festivities that are Xmas. You will definitely enjoy spending time with the kids, and they will enjoy it too. Thank you for the tablecloth pattern link. It is just marvellous and so beautifully green!!! I love a handmade Christmas. Because we have no plastic shopping bags I always make cloth bags. You can never have too many!!! A handmade Christmas is the best - especially when the handmade comes from my grandies!! For the first time in many many years xmas is not at our place!!! My eldest son asked why xmas couldn't be at his and his brothers places year about - 3rd eldest put his hand up for this year - all I have to do is make the a pav and a trifle!! This year I am making some cookies in a jar gifts for friends - something a little different to what they normally receive! Love the green table cloth Jodi - fresh and happy colour! Have a lovely week. How fabulous that your sons want to host Xmas for you - and with you in charge of the pav and trifle it's sure to be a great Xmas Day! Cookie's in a jar are a great gift, your friends are sure to love them. I love that tablecloth Jodie! I've been looking for a pattern to replace my Willow blanket on the back of the lounge and this is perfect. 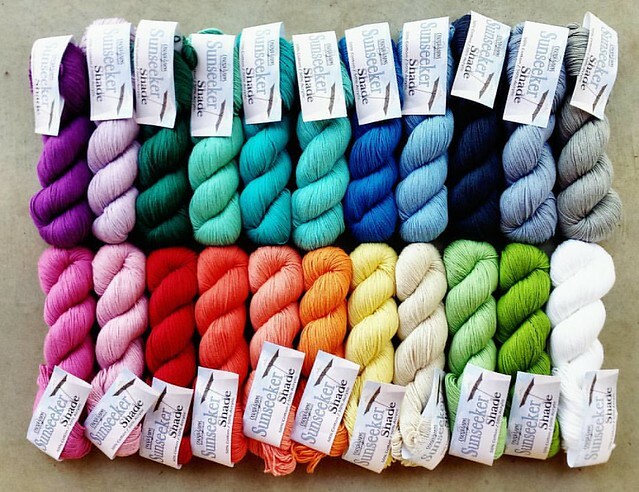 How many skeins did you use? Do you have enough in the green for me to make one? Thanks Jenny! 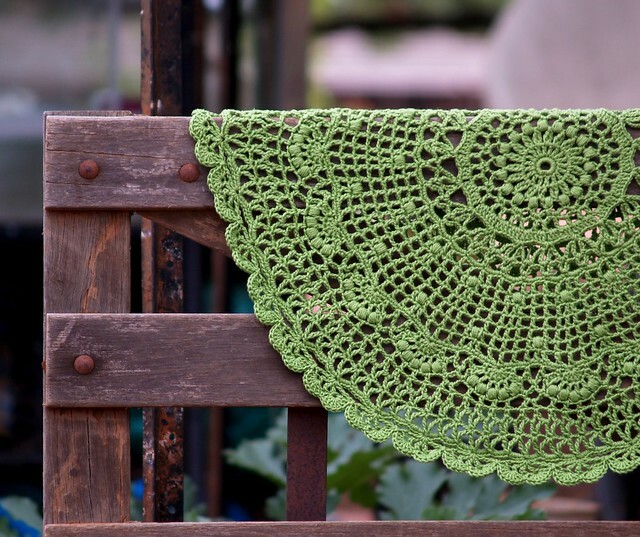 - I used just under 2 skeins for my version of this gorgeous tablecloth. I only have 1 skein of that particular green left, its been popular - sorry. Do you have a charcoal grey Jodie? Thanks for the pattern and I too was thinking of making another to compliment my Willow. I've made a few simple little doilies which I've added to my gifts for family in NZ. Merry Christmas! Doilies always make perfect gifts. Just found your blog and I love your attitude to hand-made. My plans for hand-made gifts have gone awry because of a recent heatwave where I couldn't do much at all for days. so now my last-minute-crafting has been overtaken by catching-up-on-baking!